Earlier, when discussing the (lack of) inherent advantage of the metric system, I promised a discussion of the alleged advantage of using a system built around multiples-of-10. It may be helpful first to review the notion of number bases in general. The base indicates the number that causes a “carry” to the next column. Software programmers sometimes use the “base-8” or octal notation. Thus, eight is ’10’ in octal, but ‘8’ in higher bases. Had we standardized to base-8, then the first digit after the point would have counted 1/8’s, the next 1/64’s, etc. — which would have been perfect as an exact way to represent the stock market prices before their recent decimalization. The first observation to make is that the multiplication table could have been taught in any base, and once learned, any base would have seemed just as intuitively “obvious” â€“ unless counting fingers and toes gives a leg up to the decimal or base-10 system. I am not saying that any base would have been equally convenient. Base-2 would have involved far too many “carries” and thus too many stringed digits to be easily held in the mind. Base-100 would err at the other extreme, requiring too many atomic digits stringed together to be useful. Perhaps God gave us ten fingers and toes to inspire the base-10, knowing that this was the “sweet spot” balance between too many and too few digits. But until this could be shown according to some quantifiable criterion, I am inclined to suggest that there is probably a range of bases that would have worked more or less equally well. Moreover, the discussion above already hints that indeed there are different bases that lend themselves optimally to certain specialized tasks. When one says “the building is 183 feet long,” one is using the decimal or base-10 system by virtue of stating ‘183’ with that standard interpretation. So at one obvious level, the Imperial System is in fact manipulated using 10’s. That 183 feet is also 61 yards, which is derived by division by three, is a different point. Stick with (for example) feet and that problem goes away. The Imperial and Metric systems traditionally differ not so much at the point of integer counting so much as reckoning with fractions of the unit under use. It is interesting that the Imperial (better: Peasant) System built fractions around powers of 2 — just like fractional binary does in modern computers. Fractions are built up from 1/2, 1/4, 1/8, 1/16… Division by 2 is based on equality, which is a basic concept. With a beaker of known quantity (e.g. 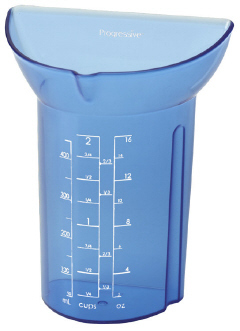 a cup) and vertical sides, you can measure 1/2 quite accurately by pouring until the “filled” level equals the “empty” area. Matching for equality is intuitive. Halving is the art of making two parts equal (where half is the amount equal to the other half). 3/4 is obtained by imagining 1/2, then adding 1/2 of the remainder. However, the mapping is not exhaustive, because of the common use of 1/3 in the cup-measure for example. Yet this too is derivable by halving: 1/3 is obtained by making the level equal to half the empty space. Thus, we could say that our fractions are the subset of all possible fractions obtained by bifurcations. Bifurcation bears a strong analogy to the fractional binary, even though not an exact correspondence. Of course, one doesn’t normally have to estimate in this manner. However, mothers can teach these principle to their children, so that the use of marked measurements reinforces a basic spatial intuition. In this way, continuity between ideation and tools is maintained. Operating in our system can be summarized like this: (1) pick a base measuring unit appropriate for the task at hand (e.g. cup, teaspoon); (2) build units upward using decimal or base-10; (3) build units downward by bifurcative fractionalization. With respect to counting, ours is a hybrid decimal and augmented-binary. Is it easier to do arithmetic with decimals or fractions? The propagandists at the U.S. 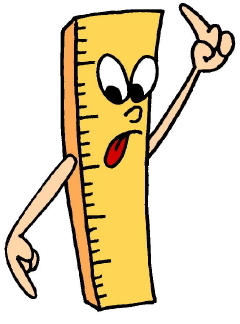 Metric Association present a number of straw-man examples to show how much easier the Metric System is to use. However, more precisely they should have stated their thesis to be how much easier decimal notation is than fractional: for the choice of base units is something different. The typical question posed by them is this: add 1 yard, 2 feet, 3-1/4 inches + 1 foot, 11-3/16 inches + 2 feet, 5-1/2 inches, etc. But this is not honest for a couple reasons. Normally, you don’t use the “yard” in conjunction with “feet.” The first entry should be 5 feet 3-1/4 inches. The intelligent child should express the fractions uniformly in the resolution needed: e.g. not 1/4 but 4/16. Follow that method consistently, and, with practice, often you will be able to do the English sum in your head, but still need paper for the Metric. The first three above become: 5’3-4/16″ + 1’11-3/16″ + 2’5-8/16″. 4 + 3 + 8 gives 15/16; 3 + 11 + 5 gives 19″ or 1’7″; carry the 1: Answer: 9′ 7-15/16″. It can be done in your head with a little practice. Now try to do the equivalent three metric numbers given in the propagandists’ page, 1.607 meters + 0.589 meters + 0.749 meters. Can you do that in your head? Secondly, only in school books do problems like that ordinarily arise. A typical problem in a wood-working shop might be 5-3/4″ + 1/8″. Semi-literate men have known how to do that for centuries. It is interesting that the people that wail the loudest about how difficult the English system is are from the educated, not the working class. It is the same with Bible translations: it is the hyper-educated that just can’t seem to understand Elizabethan English; the lower classes dealt with it just fine. But I digress. Now the answer to my quiz above: base-60 is used for counting seconds and minutes, whether on the clock or angular geometry. Actually, strictly speaking this is not base-60, for decimal numbers are used to count up to the wrap value, and when the carry occurs, it creates the next unit, not a second digit-place of the same unit. Thus, 60 seconds -> 1 minute; 60 minutes -> 1 hour/1 degree. The adult does this whole calculation without self-consciousness. It is really not very difficult. Speaking of time and our base-60 hour, ask yourself: why do we still say “quarter of” and “half past”? The metric propagandists for some reason fail to advocate decimalization of all measures. The clock, for example, is spared. In fairness, perhaps this is motivated by the realism of divide and conquer. But there are applications that are almost only used by trained technicians and specialists, rarely by the man in the street. The compass, for example. The compass is divided into 360 degrees. Why not start by decimalizing that unit? That they never propose this makes me suspicious that there is an agenda running deeper than helping people calculate more easily. My second thesis can be stated much more succinctly: when factors-of-ten going smaller are more useful, then pick your unit and do so. This is in fact done. There are rulers etched in 1/10 division. The mil in US industry is 1/1000 of an inch. The point is, the unit that is divided is arbitrary; after that, you can divide by whatever is convenient. In conclusion, (1) factors of ten are only useful part of the time; part of the time they are less desirable than other factors; (2) possibly, some base other than 10 would have been better to standardize to; (3) even granting our “fingers and toes” decimal standard: when factors of ten are needed, it can be done with the inch just as well as the meter. I grew up using the metric system and I always thought it was superior, since it is “10 based” AND it provides with an easy translation among linear, area, and volumetric measurements. For example, many people may not be aware that 1 liter of water equals to 1 kilo. And 1 liter is 10 cubic centimeters (or spelling out: 10 cm x 10cm x 10cm). I don’t think anyone would argue that such translation is not as easy to do using gallons and pounds. After reading your post, I started thinking… and I noticed you’re just like the rest of us: culturally biased! All your analysis was based on the US culture, which is expected, as you live here. And this where I changed my mind and started agreeing with you: the metric system is not necessarily superior. What is superior anyway? It has to be useful to the people, to the masses, and not only to a few “scholars” as you pointed out. I have a house and its structure is made of wood, 2 x 4″, 2 x 6″, etc. and each piece making the walls is 16″ apart. You fill this gap with insulation, and that too is already 16″ wide. After hundreds of years of building houses, how can anyone expect an entire culture to convert all of these measures to the metric system? In the US, I don’t see this as possible, not in my life time. On the other hand, other countries may build their houses with bricks, especially those in warmer locations. Guess what? Bricks in such locations are not molded and measured in inches, but centimeters. Their houses are not measured in square feet, but square meters. I was trying to tell my dad the size of my house in square feet and, of course, it made no sense to him. I had to convert it to square meters and it made perfect sense, to HIM. I’m all for standards, as long as it serves the people. I understand why we have standard sizes for windows, doors, etc., but this is still within the containment of a culture, in our case, the American culture. Thank you for such thought provoking article! You did change my mind and you made me realize that measurements are part of a culture. How can we impose such changes on people and ask them to radically change their centennial habits for the sake of â€œglobal convenienceâ€ (arguably)? Roger — I once knew, or could have figured out, that “1 liter of water equals to 1 kilo” — in HS chemistry. Fortunately, it doesn’t come up in conversation very often (to paraphrase Woody Allen, when Annie Hall asked if he knew the names of the moons of Jupiter). Since then, I have remembered the rule of thumb 1 gal = 7 lbs.